AutographsForSale.com offers hundreds of authentic hand-signed autographs from movie and television stars on trading cards, DVDs, 8x10 photos, posters and other items. This page is for ACTORS with last names from A through K whose autographs we offer including Dan Aykroyd, Jason Alexander, Alec Baldwin, Jeff Bridges, Adrien Brody, Josh Brolin, Pierce Brosnan, Nicolas Cage, Jim Caviezel, Chevy Chase, Don Cheadle, George Clooney, Bradley Cooper, Kevin Costner, Bryan Cranston, Russell Crowe, Billy Crystal, Matt Damon, Anthony Daniels, Patrick Dempsey, Robert De Niro, Johnny Depp, Danny DeVito, James Doohan, Kirk Douglas, Michael Douglas, Robert Downey Jr, David Duchovny, Clint Eastwood, Colin Farrell, Michael J. 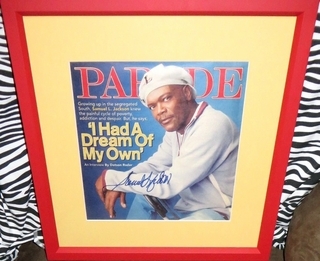 Fox, Mark Hamill, Tom Hanks, David Harbour, Neil Patrick Harris, Ethan Hawke, Jonah Hill, Tom Holland, Dennis Hopper, Oscar Isaac, Samuel L. Jackson (autographed framed Parade magazine cover shown here), James Earl Jones, Walter Koenig and many more.